Want to download YouTube videos with VLC Media Player? Here is how to download YouTube videos using VLC media player. Recently I also wrote about how to play YouTube videos in VLC player. So, you can play YouTube videos without ads, recommendations, and comments in VLC. Also, you get more good experience when you watch a movie in VLC player from YouTube. But, many people also want to download videos or movies from YouTube. So, if you are using a VLC player, you don’t need to use any website or software to do this. VLC player is a powerful and popular media player that gives more features than other media players. There are a lot of hidden features in VLC player and all users don’t explore all its features. However, VLC doesn’t allow to download video from Youtube, because there is no such option is available to do this. But, you can get the download link of the YouTube video. You just paste this link in the web browser URL to download the video. Below are the steps to do this. 1. First of all, you need to copy the video link from YouTube. 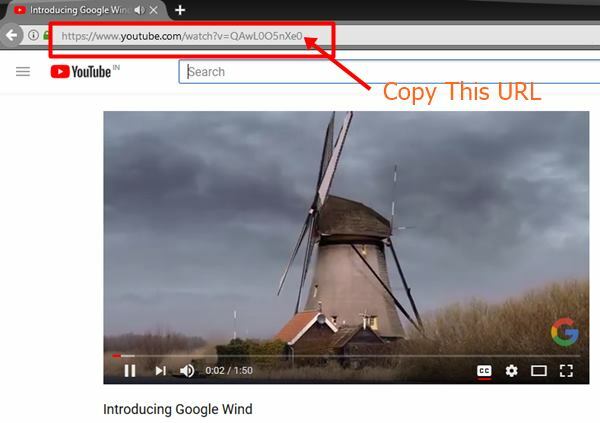 To do this, open YouTube from a browser, and search and play the video that you want to download. You will see the video link in the URL. Copy this link to the clipboard. 3. Now click on the Network tab and paste the link in Network protocol. After that, click on the Play button to play the video. 4. Now click on the Tools and click on the Codec Information option. (Keyboard Shortcut: CTRL + J). 6. Open any browser and paste that link in the URL and press Enter button. The video downloading will start. If the video is being played in the browser, then right-click on the video an select “Save video as” option to save the video. That’s all. You can open the video file from the Downloads folder. So, guys, this is the guide on how to download YouTube videos with VLC media player. However, there are many other ways available to do this. But, for VLC lovers, this is the best trick. You can also record the YouTube videos with VLC. But, this is helpful, when you want to download the only small part of a video. If you want to download the whole video, then this method is good for you.